Hi Jules,love the sound of this recipe I will try it this year for my family. I came across it after googling for a suet-free mince meat recipe. I made my first homemade pies last year and they came off a treat, here's my version!http://itinerantepicures.blogspot.com/2008/11/emmas-mince-pies-no-suet.html#linksHappy baking! Intinerant Epicure – I hope this recipe works for you. 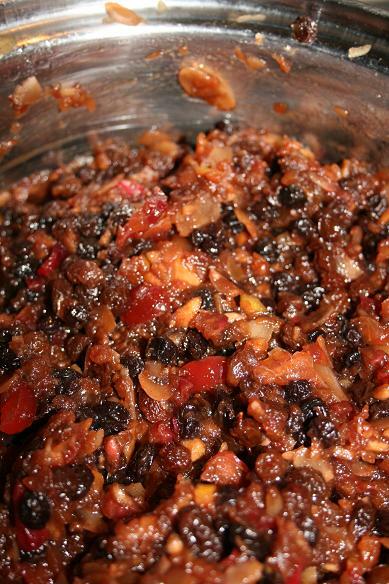 This mincemeat is now a seasonal essential in my house. anon-The reason for the suet is to keep the mincemeat moist and acts as a preservative. The recipe above works without suet because of the amount of apples. The non-suet version you have made will be fine. Just make sure you use it before the version with suet. Hope this helps. Interesting. I’ll try this one next year. Will definitely try this out…hate suet plus it’s not veggie..
hours so that the suet melts and wraps around the fruit. Thanks for that! Could see me making mince pies for my French buddies without having to wait for arrival of ‘little bruv’ with van full of relevant supplies! ….however…your input dear foodies…could we imagine a booze free version??? (oh non! I hear you cry!! )..just to avoid flying in the face of some of my students convictions… Ta muchly for your comments – Merry Crimbo to one and all and a Happy New Year! I sometimes make the mincemeat without alcohol. Just tastes slightly different.